Select Customize now to specify the software packages for your final system in more detail. This option causes the installation process to display an additional customization screen when you select Next . Select Customize now to install support for additional languages. Refer to Section 14.2.2, “Additional Language Support” for more information on configuring language support. To view the package groups for a category, select the category from the list on the left. The list on the right displays the package groups for the currently selected category. To specify a package group for installation, select the check box next to the group. The box at the bottom of the screen displays the details of the package group that is currently highlighted. None of the packages from a group will be installed unless the check box for that group is selected. If you select a package group, Fedora automatically installs the base and mandatory packages for that group. To change which optional packages within a selected group will be installed, select the Optional Packages button under the description of the group. Then use the check box next to an individual package name to change its selection. After you choose the desired packages, select Next to proceed. Fedora checks your selection, and automatically adds any extra packages required to use the software you select. The packages that you select are not permanent. After you boot your system, use the pirut tool to either install new software or remove installed packages. To run this tool, from the main menu, select Applications → Add/Remove Software . The Fedora software management system downloads the latest packages from network servers, rather than using those on the installation discs. 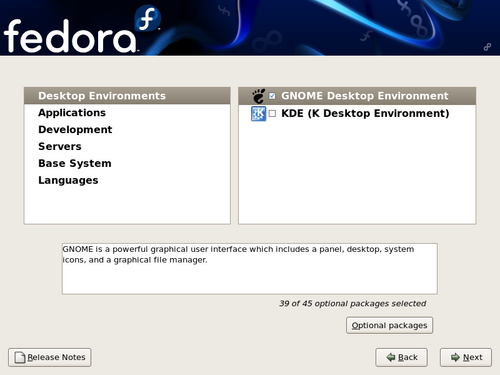 Your Fedora system automatically supports the language that you selected at the start of the installation process. To include support for additional languages, select the package group for those languages from the Languages category. Some automated processes on your Fedora system use the email service to send reports and messages to the system administrator. By default, the email, logging, and printing services do not accept connections from other systems. Fedora installs the NFS sharing, HTTP, and VNC components without enabling those services. You may configure your Fedora system after installation to offer email, file sharing, logging, printing and remote desktop access services. The SSH service is enabled by default. You may use NFS to access files on other systems without enabling the NFS sharing service.